PGprint is committed to making certain that your order is delivered to you Correct and On Time. Our guaranteed printing services ensure that we work diligently to for our customers. Being satisfied with your order is our mission, so we back up our printing with a 100% customer satisfaction guarantee. If for any reason your are not satisfied with the quality or timely delivery of your order, contact a PGprint Customer Service Representative at 1-888-288-7518 and we will reprint or fully refund the cost of producing your order. 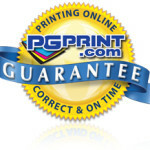 PGprint is an accredited business of the Better Business Bureau with an A+ rating.